GTmetrix now tracks more advanced timings with regards to your page load. These metrics provide even more accurate data by tracking key events. To generate performance timings, you must be logged in to your GTmetrix account when testing URLs. Log in and try it out! These are for technical users – they’re meant for providing even more insight on your page load activity. Much like our Resource Usage Graphs, they are not scores to chase unless you have a strong development background. New Timings tab available on all reports! Our unique timeline visualization gives you the event occurrences in order so you can see at a glance where they happen. Events are in order, however they are not to scale. This is due to webpages potentially having massive or negligible differences between events. We opted for to display these timings in a general order to illustrate what’s happening as your page loads. These performance timings might be new to you – so we did our best to explain each one. Hovering over each event will generate a description so that you can better understand how they affect your page performance. Hover over an event to get a general description of it. GTmetrix previously used Onload time as the point to stop the test. Due to network variances or the way the page was designed to load (eg. asynchronous loading), resources loaded after the Onload time and not make it into the report, resulting in some pages yielding inconsistent results. Instead, we now wait for 2 seconds of inactivity before stopping the test (what we now call the Fully loaded time). This used to be the point where GTmetrix would stop the test and mark as the Page Load Time in the GTmetrix report. You can choose to stop your test at Onload in the Page Settings. Again, GTmetrix reports from now on will have Fully loaded time as the default metric, along side Total Page Size and Number of Requests for your Page Details. However, you can change this to Onload time in the Page Settings, or default to it in the User Settings. If you’re seeing inconsistent results (incomplete screenshots, varying total page sizes/requests) from using Onload time, the switch to Fully loaded time should help make your results more consistent. We don’t recommend using Onload time unless you have a specific use case for it. We switched over our Page Load Time metric to Fully loaded time on Feb 8th, 2017. 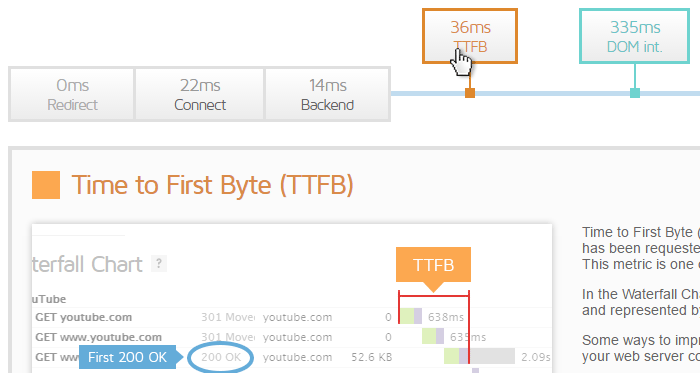 Previously, GTmetrix was using Onload time to determine the Page Load Time number. Previously, GTmetrix used Onload time as the point at which to stop the test. However, due to network variances or the way the page was designed to load (eg. asynchronous loading), resources loaded after the Onload time and not make it into the report. The result is a GTmetrix report with fewer requests for resources, smaller total page size, and as a result, a faster page load time. This was the key reason why some screenshots were incomplete or page sizes and requests were inconsistent. To make things more consistent, we have switched to using Fully loaded time, which waits for 2 seconds of network inactivity before stopping the test. Page Load times display Fully loaded time. Reports that have Stop onload enabled will show the Onload icon in the options field. Old reports that do not have Fully loaded time data will show Onload time, marked with an asterisk. Fully loaded time is used by default. You will see a tool tip alerting you of this change upon first visiting a report page. Reports prior to this update will have Onload time displayed. Waterfall Charts now also display First paint (green line) and Fully loaded (purple line). 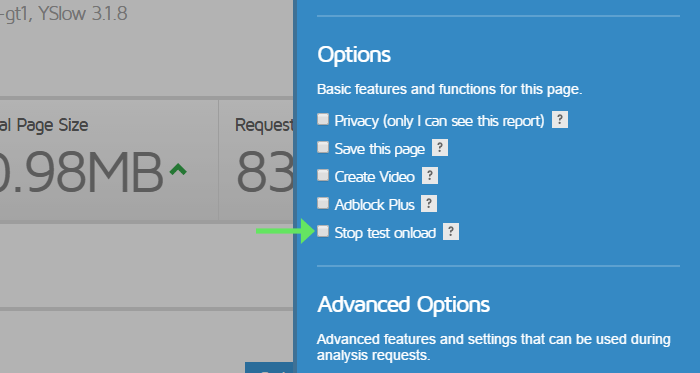 “Stop test Onload” option added to Page Settings. Your monitored jobs will analyze using Fully loaded time now. History graphs will display a new line graph (Fully loaded time – red line). Onload time will continue to display until enough Fully loaded time data is collected. Switch over will occur seamlessly. This is done to keep consistent comparisons. See our API Request Response page for more details. Log in and try out our new performance timings and Fully loaded timings today! As always, let us know if you run across any bugs or issues and feel free to tell us your thoughts on twitter (@gtmetrix) or contact us. Try out our new timings today! See your page’s performance timings and fully loaded tmings. Sign up for a Basic GTmetrix account and get more insight on your page performance – It’s FREE!